This time of year grapefruits are one of the healthiest and best things you can eat for breakfast. I wouldn’t go so far as to go on the grapefruit diet or anything, but regularly eating in-season grapefruits is a great way to start the day. 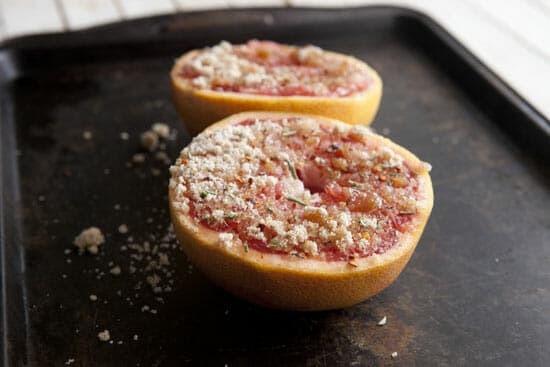 I still remember as a child when my mom used to slice open a big fat grapefruit and cut each individual segment so it was easy to spoon out of the membrane. I remember thinking that it looked like a ton of work! Of course, it really just takes a few seconds assuming you aren’t a five year old. And if you are a five year old then please don’t play with serrated knives. While grapefruits are perfectly delicious on their own with maybe a pinch of salt or sugar, quickly broiling them just ups the flavors. The quick heat makes them even more juicy and also gives you the opportunity to add on some spices. 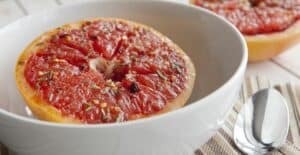 I’ve actually made a plain broiled grapefruit on Macheesmo before but I like this spiced Broiled Grapefruit version more, hence the update. 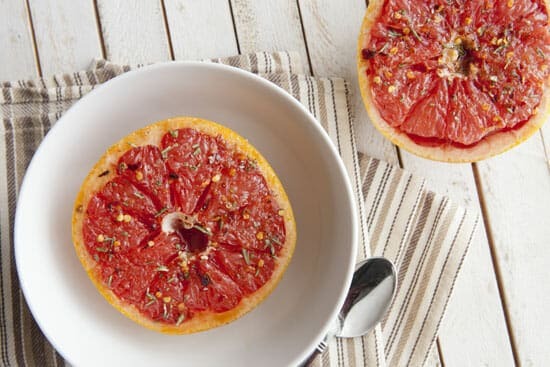 A simple sweet and spicy grapefruit. Broiled for just a few minutes to warm it through and make it extra juicy! 1) Preheat broiler to high heat. 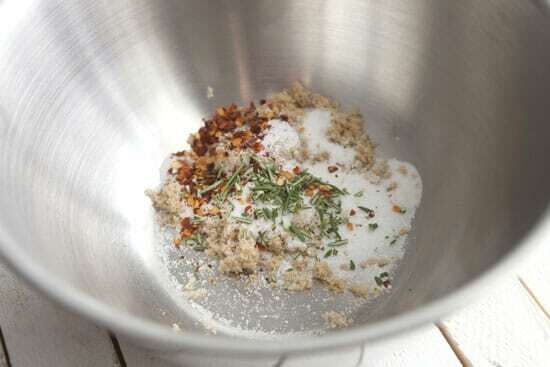 2) In a small bowl, stir together sugars, salt, red pepper flakes, and rosemary. 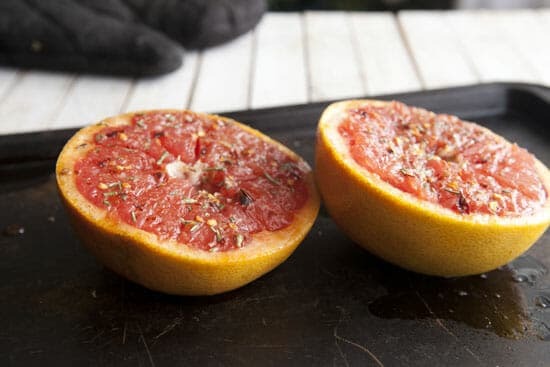 3) Cut grapefruits in half and use a serrated knife to cut around the edges of the grapefruit and into each segment to separate the fruit from the grapefruit membrane. 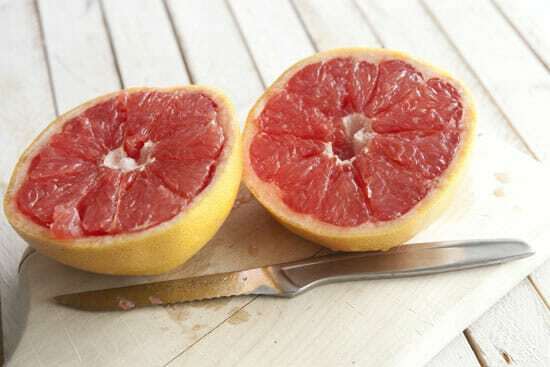 4) Divide the topping between the four grapefruit halves. Pack it on each half. 5) Add grapefruit halves to a baking sheet and broil for 2-3 minutes until sugar is starting to caramelize and grapefruit is hot. 6) Remove, let cool briefly, but serve while still slightly warm. When you slice a grapefruit in half, be sure that you slice it horizontally so you split all the segments in half. You shouldn’t cut the ends in half if that makes sense. That makes it possible to scoop out each segment half for easy eating. As I mentioned before, it will be a pain to eat if you don’t take the time to cut out each segment. Just take a serrated knife (I use a small steak knife) and run it around the edges of the grapefruit and then next to each segment on both sides. That’ll make it really easy to eat later! I used a little less sugar than in my previous version and instead added some fresh rosemary and red pepper flakes. Honestly, I could’ve used more red pepper flakes for my tastes, but I like stuff pretty spicy so I kept it light. Sprinkle on a bit more though if you want. At this point, this is barely a recipe. Preheat the broiler to high heat and position the rack of your oven so the grapefruit will be an inch or two away from the heat. Then add the grapefruit to a baking sheet and pack on the topping! Do your best to make the grapefruit halves level or they will broil unevenly. Keep a really close eye on these while they broil. The sugar will melt and start to caramelize and the grapefruit will heat up which makes it incredibly juicy. You won’t need to broil it for more than about three minutes, but I would check on it after 90 seconds. Let the Broiled Grapefruit cool a bit before serving, but definitely serve them while they are slightly warm. A Broiled Grapefruit is a great start to the day and you’ll find the best grapefruits this time of year. It can be ready and on the table in under 10 minutes which is always nice. Anybody a grapefruit fan? Have you ever broiled them? Unreal I just ate a plain one and now I want one like this, it looks so good!!!!! Such a clever idea! I’ll have to try this next time I reach for a grapefruit (which will likely be very soon).